Eldrid – The nature-loving faction that strives to remain at peace. Jennerit – The Socialist faction with an elite group of immortals. LLC – War profiteers made up primarily of robots. Peacekeepers – The sworn protectors of Solus. Rogue – The faction that isn’t a faction. 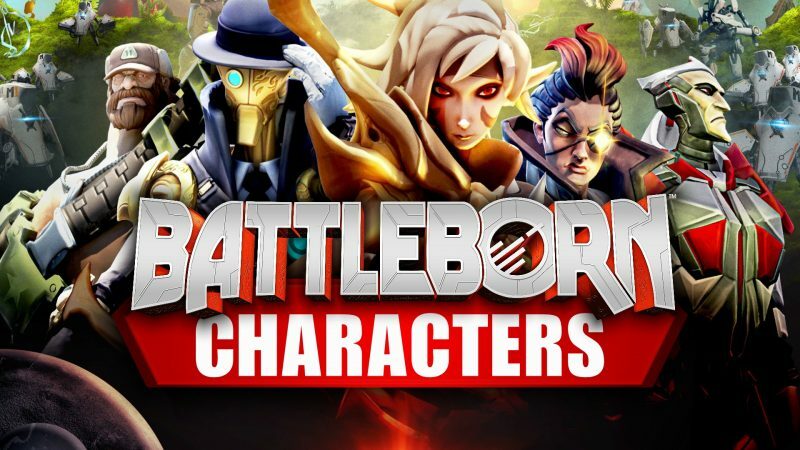 Battleborn is not just the name of the game but also how you describe the playable characters in the game. These are a group of heroes, they are the champions of this game. Battleborn is a hero shooter and therefore features a wide range of playable characters. The game contains 30 unique heroes divided over 5 different factions. You can find their profiles on the hero list. Each faction has a unique skill assigned to their champions. The Eldrid have Health regeneration, the Jennerit have Life Leech and the Peacekeepers have large shield capacity. During your adventure, you can play characters ranging from a cyborg Hawkman to samurai vampires to mini-gun wielding man-mountains. If you like slash and parry, run and gun, cast and dash, or simply obliterate your foes. Battleborn has it while you are building and growing your personal team of heroes. You start the game with 7 heroes and unlock the other Battleborn by playing the game. In broad terms you can divide the Battleborn heroes into 3 classes. These 3 character archetypes are; Attacker, Defender, and Supporter. This not just only tell what type of character you are picking but it also has a benefit on the battlefield. Because depending on the role you play your character will get a boost against non-player enemies. Attackers deal 15% more damage to non-Battleborn enemies. Defenders take 15% less damage from non-Battleborn enemies. Like I mentioned the ‘character role specialization’ divides the heroes into 3 big archetypes. However, each Battleborn has a different take on that role. This is where the character’s classifications come in. These will tell you where the hero excels in. As one hero might be better in attacking and pushing the team forward. Another hero could be very good at defending and keeping its ground and therefore is very territorial. There are a lot of classifications like; Healers, Shielders, Snipers, Disruptors, etc. These describes their play-style. Adorable: Because Toby is an adorable penguin. Agile: The character is fast and/or highly mobile. Often includes skills or helix augmentations that increase mobility. Focuses mainly on vertical movement. Assassin: The character is specialized in taking down a single target fast. Brawler: The character is adept at getting into and staying in fights. Combat: The character is exceptionally useful in the middle of a fight. Controller: The character has a lot of crowd control (CC) abilities that setup or assist the team. Disruptor: The character has quite a few crowd control (CC) abilities that stop or interrupt the enemy. Healer: The character specializes in restoring allies’ health. Initiator: The character is especially adept at starting fights. Usually involves a combination of movement abilities and crowd control. Mobile: The character is fast and/or highly mobile. Often includes skills or helix augmentations that increase mobility. Focuses mainly on horizontal movement. Pusher: The character has a good Area of Effect damage and/or fast minion clear. Rescuer: The character is especially adept at last second saves that mean the difference between life or death. Shielder: The character specializes in restoring allies’ shields. Skirmisher: The character is specialized in hit and run or guerrilla tactics. Sniper: The character can accurately hit targets at long range. Does NOT mean the character needs to stay far back. Stealth: The character can cloak and disappear from sight. The only indication is a slight shimmering effect. Territorial: The character specializes in controlling a specific area. Versatile: The character is flexible and can fill or specialize in multiple roles. Easy – These heroes play very straightforward. Complex – These characters have ability combos you need to pay attention to in order to use them well. Advanced – These characters require the use of combos, specialized skills, or technical play to use them well. Every Battleborn hero plays from a first-person perspective and has a unique playstyle mechanics. They not only differ by looks but also how fast they are or how high they can jump or even if they can fly. They all got different stats on how each of them performs in the amount of Health, Power, Range & Speed. While the Battleborn heroes outperform other heroes in some departments they also have their flaws. For example, ISIC may have a very high health gauge, but he also has a very slow movement speed. However, there are ways for ISIC to get around much quicker by using one of his special abilities. Each character has 3 unique special abilities. These can be powerful attacks or special boosts. Once you use them they need to recharge and unlock after the countdown timer resets the skill. You are able to use two of these from the start of the game. The third is your Ultimate ability and is unlocked after leveling your character’s Helix to level 5 (The Helix Skill Tree will be explained further down this page). Your hero also comes equipped with a passive skill, these affect your hero’s playstyle by giving boosts or abilities when certain conditions are met. By playing the game in story mode or multiplayer mode you will earn experience points. 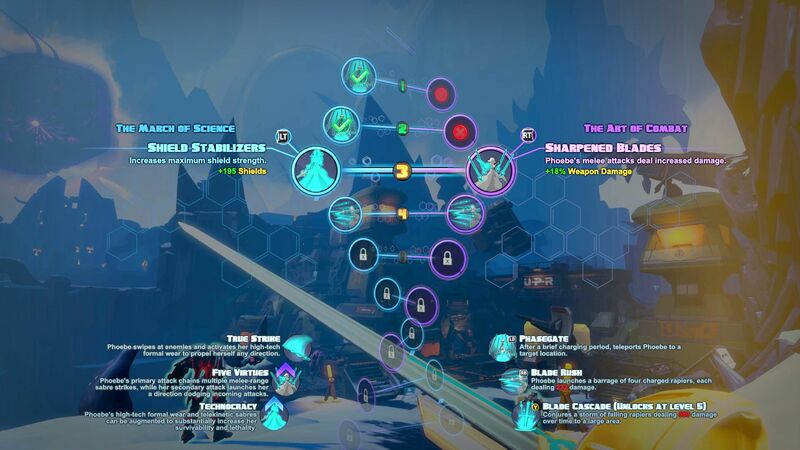 This will let you rank up three different leveling systems in Battleborn. Each of these leveling systems will reward you in different ways. By playing Battleborn a lot with one hero you will manage to level up that specific character. This is called Character Rank. With each tier you will unlock cool new stuff for your hero of choice. Character Rank goes up to level 20. Rewarded a Faction Loot Pack for the associated character faction. Rewarded a Title and a Faction Loot Pack for the associated character faction. Reach Rank 15 and complete all associated lore challenges: Rewarded a Skin and a Badass Title. As you earn experience points you can level up the character rank of the hero that you currently playing. This character rank will unlock cool new stuff for that specific hero. These can be new skins, for example, Benedict’s basic green Peacekeeper outfit will have a captain America look. Another way to customize your hero is to give them new taunts, these are short animations that you can use to mock your opponent after killing them in an online battle. You can outfit your character with gear that you gain during your playtime. These pieces of gear boost your hero and make them a real champion.